For the subway station, see one-north MRT Station. one-north is a subzone and business park located in Queenstown, Singapore. The park was developed by JTC Corporation for the R&D and high technology cluster, comprising biomedical sciences, infocomm technology (ICT) and media industries. Though the development was first conceptualised in the National Technology Plan 1991, it was only launched officially in 2001 by former Deputy Prime Minister Tony Tan Keng Yam with the basis of creating a "global talent hub" and a knowledge-based economy. one-north, which was master planned by Zaha Hadid Architects, is located near educational and research institutes like the National University of Singapore (NUS), INSEAD, Singapore Institute of Technology (SIT) and the Singapore Science Parks. In 2012, ESSEC Business School also set up its Asian campus in one-north, for a total investment of S$40 million. The district has easy access to social and recreational facilities due to the close proximity to Holland Village. Besides being a "science hub" as Dr Tan described one-north at the launch, another aim is to create a community where expatriates and locals can gather to live, work and relax together in one-north. As such, one-north will not be a government project only, but also one where private sectors contribute to provide the social and recreational amenities for the people working and living there. Biopolis is a biomedical R&D hub at one-north. It houses public research institutes and private research organisations. Biopolis Phase 1 is developed by JTC Corporation (JTC) at a cost of S$500 million. Phase 1 of the Biopolis comprises a cluster of seven buildings with a built-up area of 185,000 square metres (2 million sq ft). Phase 1 is home to more than 2,000 scientists, researchers, technicians and administrators. The research community is supported by infrastructure and services catering to biomedical R&D activities. Phase 2 of the Biopolis comprised two research buildings, with a built-up area of 37,000 square metres (400,000 sq ft). Phase 3 of Biopolis broke ground in April 2008. The research facility extends basic research activities into translational and clinical research as well as medical technology research. The Star is a 15-storey mixed use complex integrating a performing arts centre known as The Star Performing Arts Centre and a shopping mall known as The Star Vista. It is located near Buona Vista MRT station. 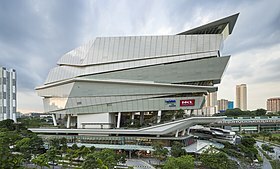 The Star Vista (Chinese: 星悦汇) is a shopping mall occupying the bottom six floors of The Star, four of which are basement levels (1 floor of retail and 3 floors of car parks). The mall is developed by Capitaland Malls. The Star Performing Arts Centre (Chinese: 星宇表演艺术中心), also known as The Star PAC, is a 38,000-sq m performing arts center located in the top nine floors of The Star (levels 3 to 11). It was completed in Oct 2012 and officially opened on 1 November 2012, with an inaugural concert by David Foster. It is designed by Andrew Bromberg of Aedas Architects, and is owned by the business arm of New Creation Church, which makes this their main worship venue. The Star PAC is a 5,142-seat performance venue. Aside from the main indoor concert hall, it also features a 770-seat function hall, an outdoor 300-seat amphitheatre, multipurpose rooms and a roof-top reception area. 20 October Red Velvet Red Velvet 2nd Concert "REDMARE"
Occupying 30 hectares of land within one-north, Fusionopolis is envisioned to be an R&D hub for infocomm technology, media, physical sciences and engineering industries. Fusionopolis Phase 1, developed by JTC Corporation, is the first work-live-play-learn development in one-north. Opened in October 2008, it houses public agencies such as A*STAR, MDA and SPRING as well as private companies to foster collaborations across industries, research institutes and businesses. Fusionopolis Phase 2A will yield 103,600 square metres of business park and R&D space, when completed. Phase 2A houses dry and wet laboratories, clean rooms and vibration sensitive test-bedding facilities. Fusionopolis Phase 2B is a 50,000-square metre development by a private developer which will provide business park and laboratory space to house agencies and companies that would form collaborations with those from Phases 1 and 2A. Block 71 Ayer Rajah Crescent, a decades-old flatted factory within Ayer Rajah Industrial Estate, was repurposed in 2010 by the Media Development Authority to be part of one-north. Externally, as the oldest building in one-north, it lacks architectural consistency with the rest of the development. Internally, however, it is one of Singapore's high-tech hubs, with dozens of digital startups and VC funds sited directly across the street from Fusionopolis and the one-north MRT. In March 2014 the landlord announced that the cluster of flatted factories would be expanded to JTC LaunchPad @ one-north, a start-up cluster also comprising Block 79 (previously the JVC building) and Block 73 (new modular temporary construction). The start-up cluster hosts the Action Community for Entrepreneurship's International Centre (ACEIC) which helps Singapore start-ups expand overseas by providing resources, advice and access to new networks and markets. Launched in early 2006, Rochester Park, a part of one-north, is a heritage site located off North Buona Vista Road, featuring several double-storey black-and-white colonial bungalows, a symbol of Singapore's colonial past. The estate has a long history with the 40 black-and-white bungalows built in the 1940s to accommodate the British military soldiers stationed at Pasir Panjang Military Complex and their families. After the British military pulled out of Singapore in late 1971, the bungalows were handed over to the Singapore government who rented them out mainly to non-Singaporeans. To provide cultural and recreational facilities for the people in one-north in the present day, Rochester Park has been revitalised into a dining and lifestyle retail hub known as Rochester Mall. The old black-and-white colonial bungalows in Rochester Park have been preserved under the Urban Redevelopment Authority's conservation guidelines and are now leased to over 30 food and beverage and lifestyle retail tenants. Rochester Park 11 has 11 bungalows turned into a dining and lifestyle retail hub consisting of restaurants, galleries, and spas. Nine units are taken up by restaurants and bars and a holistic healthcare centre. Rochester Park 20 is still in the midst of development but has set aside 20 of the bungalows to become a serviced villa resort with retail facilities. ^ Tan, T K Y, (4 December 2001). Launch of Science Hub Archived 27 September 2007 at the Wayback Machine, speech presented at MITA Building, Singapore. ^ JTC Corporation, (2006). .
^ a b "The Star Performing Arts Centre | Event Venue Singapore". The Star PAC. Retrieved 29 July 2018. ^ "About the Mall | The Star Vista". www.capitaland.com. Retrieved 29 July 2018. ^ Uy, Melody. "The Star Performing Arts Centre opens in Singapore". Asia Onscreen. Retrieved 7 November 2012. ^ Kok, Melissa (3 November 2012). "Big Star among Friends". The Strait Times. Retrieved 3 November 2012. ^ "Yiruma back to wow Singapore audience in November". MeRadio. Retrieved 26 January 2017. ^ "Hillsong UNITED "EMPIRES" Tour". The Star Performing Arts Centre. Retrieved 26 January 2017. ^ "Macklemore and Ryan Lewis Live in Singapore". The Star Performing Arts Centre. Retrieved 26 January 2017. ^ "Buzzing: Macklemore & Ryan Lewis to play in Singapore". The Straits Times. 1 June 2016. Retrieved 26 January 2017. ^ "Passenger Live In Singapore". The Star Performing Arts Centre. Retrieved 26 January 2017. ^ "LIVE NEWS: TWO DOOR CINEMA CLUB – LIVE IN SINGAPORE". popwerofpop.com. Retrieved 26 January 2017. ^ "JOURNEY LIVE IN SINGAPORE". One FM. Retrieved 26 January 2017. ^ "Journey to return to Singapore in February 2017". Channel Newsasia. 15 November 2016. Retrieved 26 January 2017. ^ Rheubottom, Robert (20 October 2016). "ames Taylor announces 2017 world tour dates". AXS. Retrieved 26 January 2017. ^ "Yiruma Live in Singapore 2017". a-list.sg. Retrieved 26 January 2017. ^ "A-Lin「Sonar 声吶世界巡回演唱会」新加坡回声限定场". The Star Performing Arts Centre. Retrieved 26 January 2017. ^ "Bethel Music Worship Nights". The Star Performing Arts Centre. Retrieved 26 January 2017. ^ "Fifth Harmony to perform in Singapore this April". The New Paper. 17 January 2017. Retrieved 26 January 2017. ^ "Best of Rimi Natsukawa Live in Singapore". The Star Performing Arts Centre. Retrieved 26 January 2017. ^ "Harry Styles announces world tour, reveals Singapore date". Bandwagon. 28 April 2017. Retrieved 28 April 2017. ^ "Shawn Mendes' Illuminate World Tour concert coming to Singapore on 9 Dec". Yahoo Singapore. 29 March 2017. Retrieved 29 April 2017. ^ "Singapore unveils Silicon Valley- inspired LaunchPad @ one-north". The Business Times. The Business Times. The Business Times. 13 March 2014. Retrieved 6 April 2019. ^ "New centre launched at JTC LaunchPad to help local start-ups expand overseas". The Straits Times. The Straits Times. The Straits Times. 6 September 2017. Retrieved 6 April 2019. ^ a b Lim, A P, (1974). Changes in Land Use in the Former British Military Areas in Singapore. Unpublished academic exercise, Department of Geography, National University of Singapore. ^ "Welcome To Rochester Mall". rochestermall.com.sg. Retrieved 29 July 2018. ^ Soo, K L, (27 March 2006). Welcome Remarks, speech presented at Rochester open house, Singapore. ^ Sim, A, (17 January 2007). Cultural-retail landmark to up cool quotient for one-north, The Business Times Singapore. Wikimedia Commons has media related to one-north. This page was last edited on 6 April 2019, at 02:06 (UTC).